Tuna with minced vegetables open faced on a toasted slice of multi-grain bread with avocado and sprouts. A quick and easy, satisfying lunch. Other sandwiches I love that don’t require heating up are Egg Scallion and Tomato Sandwich, Grilled Chicken Sandwich with Avocado and Tomato, and my favorite… Roast Beef, Arugula and Shaved Parmesan. I grew up with avocados in my home way before they became popular here in the States, and squeeze them into my diet every chance I can. Avocados are a regular part of a South American diet, and my mom always served them along side a hearty bowl of hot soup or rice and beans. Avocados are also good for you, loaded with heart-healthy fats and antioxidants. To make the tuna salad quickly, I throw all the vegetables in my chopper and pulse a few times. If I am eating one sandwich, I keep the rest refrigerated for the next day. Easy peasy! 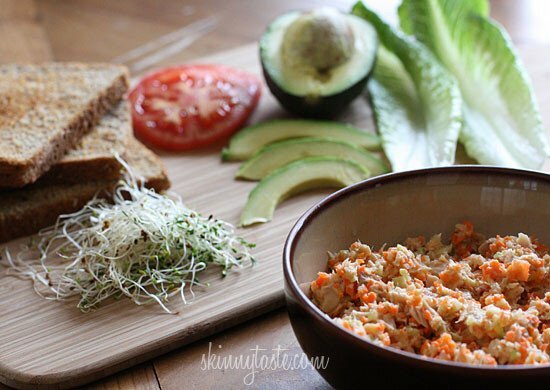 Tuna with minced vegetables on a toasted slice of multi-grain bread with avocado and sprouts. A quick and easy, satisfying lunch. Combine tuna with minced carrots, celery, red onion, mayonnaise, vinegar, salt and pepper. Place lettuce on toasted bread. 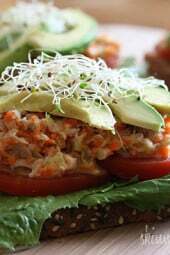 Top with tomato, tuna, avocado and alfalfa sprouts. What chopper did you use? 1 serving of Leftover mushroom ceviche with juice (excluded the red wine vinegar), 10 baby carrots, fresh cilantro, and 1 pickle spear. Normally I add pickle brine to my tuna salad to give the flavor some depth. But because I added the ceviche juice, there was plenty of liquid. Left out the avocado so I could eat another slice of bread. So delicious and now satisfied!! For the future, I think I’ll leave out the mayonnaise since I couldn’t taste it. Tried this last night. It was amazing! Filling, low on points, and delicious. It’s definitely going to become one of my staples when I have avocados! Do you know how many points without the bread? Instead of mayo or yogurt (dairy), I use a non diary product called veggenaise. It is usually made with soy and it is just delicious. 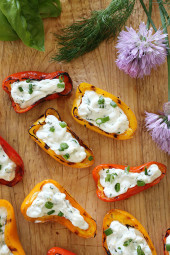 It is not ff, so go lightly as you would with any mayo but it doesn't contain any animal products if one is staying away from dairy or lactose intolerant. this came really good, its simple and cheap, and good protein source.. Probably tastes better with mayo than greek yogurt. I just made this with greek yogurt and it was very bland tasting. I added a bit of curry powder to the tuna mixture to give it some flavor. Was ok. Thanks for this recipe. It was yummy! I love when i make something and it looks just like the picture. This was absolutely awesome. Even my kids liked it. And they hate everything. However, I did substitute sweet pea shoots for the alfalfa sprouts as they are not sold in our stores due to the bacteria danger. Also, I substituted non-fat miracle whip and used safeways's Mountain Grain bread. With these substitutions, my calorie count came down to 198 calories! There has been a recommendation to not eat sprouts- risk of bacterial contamination is too high. Really loved this! I never thought of putting carrots in tuna salad. It looksmgreat on a plate and tastes even better. Thank you. Hi!ma friend of mine has introduced me to your sight and I'm OBSESSED and have told everyone who will listen! I am getting married at the end of the year, so yor sight is amazing. Quick question, I'm not a big tuna fan. Could you replace with a chicken salad? Would this affect PP? Thanks!!! This looks so yummy! I love avocados too 🙂 I've never made tuna with diced carrots or Greek yogurt (instead of mayo) but I think I might try it. Thanks for sharing!! The boyfriend LOVES tuna but I can't eat it after I became ill years ago (bad mayo but it ruined the taste for me). Think I will make this as a chicken salad instead. 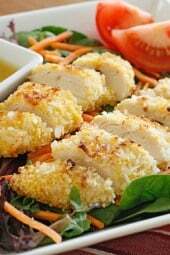 It looks so delicious , I'll try this today : thanks Gina for all your recipes. I hope for you and all your family the Best for this New Year. If you haven't tried water chestnuts in your tuna salad it is fabulous!!! I love the crunch it gives it. I can't wait to try this! Try a little jicama chopped into small sticks!! I like them better the water chestnuts and they are not as starchy. Looks and sounds delicious. When I was a teenager, my Dad and step mother would take me to a cafe that served tuna with shredded carrots, onions and sprouts on mutligrain bread. I've been replicating myself for years on whole wheat pita. 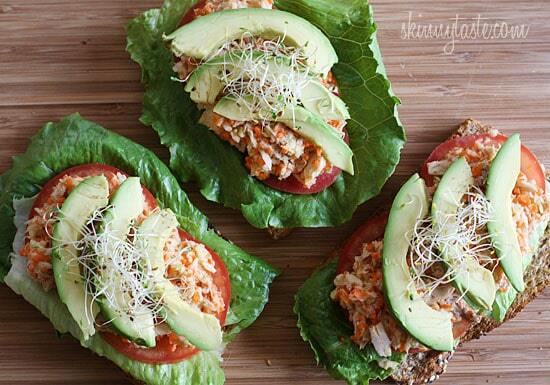 I love avocado and have never thought of pairing a veggie tuna sandwich and avocado. It was delicious. Thanks for the wonderful lunch idea. I'm so happy you enjoyed it!! This is my kind of lunch! I adore tuna (though am the only one in my house) and avocados seem like the perfect partner in crime. I love all of your recipes and can't wait to try this one and get your cookbook once it comes out! Oh! That looks tasty and bet it would be good without the bread as a lettuce wrap. I would probably deduct 2 points if not using bread. Most "regular" breads are 2 points/slice. 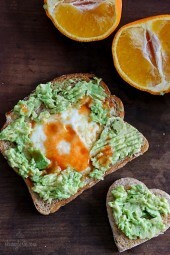 Totally agree with you about avocados – just love em! 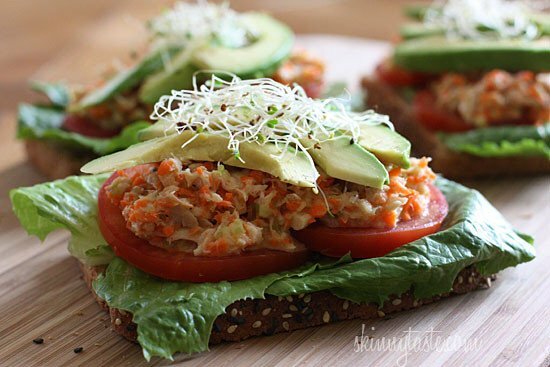 This sandwich looks so tasty I'm adding tuna to my grocery list now! Gina, where have you been able to buy sprouts?? We can't even get them at Jimmy Johns anymore here in Columbus because of the salmonella scare! Got them in my local Health food store, micro greens are great too! No lie, I just made a tuna+rice+avocado salad before reading this. It's a great gf alternative to sandwiches. Mish-mash 1 c dry brown rice, cooked; 1/2 avocado, mashed, 1 can tuna, 2 T lemon juice, dashes of paprika, pepper, cayenne, garlic powder to taste together in a bowl. It's helping me through the flu! If it's got avocados count me it! This sounds so yummy. Is this on regular bread or lite bread? Just wondering for the points values. Looks delicious! I used Arnold's Multi-Grain, not light. Just bought a couple of avocados and tomatoes! This is perfect. Thank you! Avocados and tuna sandwiches two of my favorites! What a nice new way to enjoy a tuna sandwich! this looks so delicious! can't wait to try! How much celery, onion, and carrot is it before it's minced? having this today for lunch! I LOVE LOVE LOVE avocados!!!! From guacamole to plain with a little lemon and salt I try to justify putting them in any recipe I can! LOL Can't wait to try this! Can't wait to make this – looks amazing!